In a memorable scene from the 1976 film Network, a deranged TV anchorman implores his national audience to take a stand against injustice everywhere; to announce to the world, "I'm as mad as hell, and I'm not going to take this anymore!" In a mass response, a multitude of viewers at home take to their opened windows to scream this invective proclamation at the top of their lungs. Though this is both fiction and amusing, it does illustrate how close to the surface anger is in many people without their even realizing it. The object of anger isn't really important here. Indeed, when people finally do blow their tops, it's to vent an accumulation of perceived "injustices" that have occurred over a period of time, sometimes years. Suppressed anger and resentment congeals into frustration, then bitterness, and finally depression. So expressing anger as rage feels empowering; its release momentarily makes us feel liberated. Obviously rage accomplishes nothing and is frequently correlated to violence. 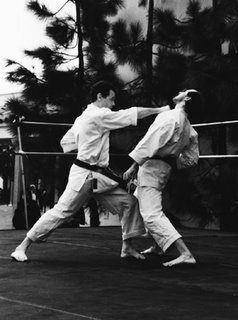 How does the martial arts prepare us for the onset of anger in others, or more importantly, in ourselves? Realize that angry people thrive best in the presence of other angry people. We can't control the way others behave. But we can check our own impulses. Anger first manifests as physical symptoms in the body: increased heart rate, erratic breathing, and muscular tightness. Converting anger through sublimation can be effective. Through the alchemy of martial arts training one can bring about positive change. If vou can't get to the dojo to work off some steam, taking a slow deep breath can work wonders. Mark Twain had an interesting antidote for anger: counting to 10. I don't recommend sparring while in this condition, however. I remember witnessing a black belt a while back demolishing a novice in a fit of rage because the latter managed to get in a few good shots. It was a bad day for karate. First, I wanted to say that I really enjoy reading your thought-provoking and articulate posts. Over the last half a year, I have been thinking about suppressed rage, and how it affects the body. This is because I realized that many chronic health problems which I had been suffering from for a number of years were in fact due to rage and sadness left over from childhood and daily stresses. You are spot on when you say that suppressed anger turns into depression. I believe someone said that, "depression is anger turned inwards". Anger and rage are natural emotions in humans. However, in our society, we are conditioned to not demonstrate that we are angry or let it be seen. In childhood, it would invoke displeasure from our parents, and in adulthood, our own shame and the judgement of others prevents us from expressing anger healthily. The example of the people shouting from their windows is perceived as somewhat amusing. Whereas imagine for a moment seriously doing such a thing...I think it might be cathartic for more than a few of us! There are many layers to the mind that we are not aware of in our conscious existence. I have found that I am unaware of much of the deep anger and resentment I have stored up until *after* I start beating up a cushion. So I find this a good exercise to do even when I am not feeling angry to begin with, as it has the surprising effect of bringing anger out. Thanks once again for a very nice weblog. How we label emotions is interesting. Like almost everything it can be placed in a dualistic paradigm of "good" or "bad". It's the taoist concept of "mutual arising" that gives birth to the "ten thousand things". But ask... "Do you have a big toe?" Of course you do... "Why"... it came with the set! Feelings are the same way. We 'think' that some are 'good' and some are 'bad' but in reality they ALL come with the set... and they ALL have a purpose. For example it's appropriate that we get angry (as well as sad) when a child dies an unnecessary death or when there are genocides and other such atrocities. So then what is the actual purpose of anger? Anger is the feeling that helps us get what we want! If you place us 40,000 years ago (and science tells us we were basically the same creature then as we are now) and the saber tooth tiger came along and stole the family winter survival food then anger mobilized us to get it back armed only with a pointy stick!! The trick would seem to be how we "ride" our anger. How we "own" it and bring it into ourselves. How we re-frame it, like other 'uncomfortable' feelings such as pain or fear, as a gift. The 'rage' that is let loose is actually a reservoir of 'dammed' feelings that we mis-label as 'damned' feelings. The real issue is usually that we are unaware of them or afraid of them and so we hide them, or deny them; or most likely both of the above. When this happens we are out of touch with ourselves. In contemporary society, especially with pressure to be 'politically correct', we are particularly prone to deny that we even have such feelings. But the irony is that our society is simultaneously 'entitled' and narcissistic, so we are often writing a long list of wounds and transgressions. The combination results in egotistical "catch 22". If one is unaware of feelings and they are not integrated into oneself (you know... "integrity"!) then these feelings do not go away. They simply function out of our control. And like any caged animal, when the cage breaks the beast reeks havoc. How much better it would be to let the animal be the animal. See its part in the total wheel of creation and respect it. Allow it to find its place so that balance is maintained. Martial arts should be expanding our awareness and empowering us. And the most important sparring should be with our own ego and selfishness. As St. Paul said, "Fight the good fight." Remember too that according to the New Testament even Christ got angry and threw the money lenders out of the temple. So much personal energy and emotional resources are released by facing, and listening to its message. This extra energy can then be spent on a more productive process... understanding. When you truly understand you can decide if anger is appropriate. If so then follow Twain's advice and "count to 10" but you must add W. C. Field's axiom to it. He recommends such counting to a little girl who has just had rocks thrown at her by a group of boy bullies... After she finishes counting he adds... "Now are you angry?" "No" she replies. "Good" he quips, "You can take aim!" I agree - I think anger itself isn't necessarily a negative emotion. All it is, is energy. It's how we use it that counts. Anger can be used like any other energy, it can be creative, rather than destructive. However, on the subject of sparring - I have only ever once been angry while sparring and the results were really instructive! My technique went right out of the window in my rage and my opponent was able to shut me down effectively. Perhaps it is because I am not at Black Belt level, but it certainly taught me a lesson. I believe that Martial Arts should teach you how to deal with the energy that anger produces and not necessarily teach you how to control your emotions. Control is sometimes about suppressing energy and not allowing it to flow. The difference is learning how to 'go with the flow' without being swept away or allowing it to damage anyone else! Suppressed negative emotions can indeed make you sick. The mind and body are inseparable. It's important to realize that just reacting against these feelings can quite often be worse than the feelings themselves. Thank you for visiting my site and especially for your kind words. Welcome to my site. The counting trick is surprisingly effective for most people, myself included. Twain was a pretty good philosopher and observer of people. Fields too, but he had some issues. Both guys were masters of dry humor. Thanks for stopping by. Going with the flow of something like anger is a tricky undertaking. A Zen master would say, 'don't fight it - just go with it', or something along those lines. Easier said than done! Strong emotions by their nature sweep almost anyone away, including some so-called martial arts experts. 'The real enemy is within' is a basic tenet in the martial arts. Very nice to hear from you again, KFG. Being angry is ok. Losing control of yourself is not. That's how I look on it. "Suppressed negative emotions can indeed make you sick. The mind and body are inseparable. It's important to realize that just reacting against these feelings can quite often be worse than the feelings themselves." Eventually I decided that mindset was just not helpful and would never result in any real improvement or healing. It is a challenge to keep those lessons in mind, since every once in awhile they're needed yet again, but the outcome is certainly better than just stewing in bitterness. Really nice post. I have learned a great deal about the effects of deep proper breathing methods from Tai Chi/Gi Gong training. It is absolutly a wonder technique and I use it a great deal more in karate training than ever before. Losing control is not ok. Agreed. But not letting anger flow at all causes it to become solidified into bitterness. We can't necessarily eliminate anger altogether, but there are healthy ways to transform it. Just being aware of the fact that we're angry is a good start. The body has an amazing knack of eavesdropping on our thoughts. Fortunately it can respond to the good ones, not just the bad. The breath apparently has a built-in faculty that affects emotions and health in general. Eventually I'll get around to checking out tai chi/chi gong for myself. Regarding healthy ways to transform anger -- there are things like counting, or beating up a pillow. I have found it very useful to keep a journal, focussed mostly on anger, rage, and feelings of low self-esteem -- all painful feelings we would rather not experience. In fact, expressing anger in this way was crucial for me in overcoming (physical) health troubles. It also adresses the point of becoming *aware* of our anger. Once you start to write a list of things bugging you, more and more comes out, whose existence you might have completely forgotten about. This happened for example with episodes from my childhood which I had forgotten about, which I didn't even realize were still causing me resentment today! There is the issue of finding time; I only started to do it when I was desperate enough because of the state of my health. But 15 minutes a day of some introspection can't be a bad thing for anybody. "How does the martial arts prepare us for the onset of anger in others, or more importantly, in ourselves?" Maybe MA helps us by giving us an opportunity to know ourselves better. For example, how do we react to failure, or what is one's reason for learning MA. Knowing your self -- your weaknesses, psychology and motivations can prepare you to deal with anger in yourself. Ever seen "analyse this"? Love it when DeNiro shoots the pillow. I've come to think that the hardest part of anger is letting it out with gentle words. Supress anything for so long, no wonder we have problems dealing with it. - Bad day for karate indeed. I remember reading that some karate masters were famous for their distorted faces while doing kata or kumite. In fact, the whole style was based on anger and beastiality. Can't remember the specific style. It was an interesting read to say the least. a nice parralel can be made with L'Île du docteur Moreau. That book deals a lot with anger. To know yourself better. One of the reasons we train. Thanks for your comments. DeNiro - one of the greats. What a portrayal of Jake LaMotta in Raging Bull. I read the book too. There's an example of sublimating anti-social behavior in a culture - boxing. If it wasn't for prize fighting the prison population would probably be triple than what it is now. I've never tried sake. I'll take your word for it! Hitting a pillow never worked for me. It isn't solid enough. Now a hanging bag, that's a different story! Thanks for the welcome… it’s good to be here… you’ve got a great blog going. There are very clear and documented negative results from not dealing with emotions, especially anger. For example “depression” is the opposite of “expression” and when we cannot “express” out feelings and they are important, then we have to shut them all down and thus “depress”. Because anger particularly is a ‘combative’ emotion when we push it inside it “beats us up” on the inside thus resulting in the negative health consequences. The breathing issue and corresponding techniques relates to the fact that this process is the automatic survival process that is the easiest and most accessible to conscious control… you can cause a rapid or slower breathing rate much easier than you can cause your heart to beat faster or slower… controlling heart rate is rarely achieved consciously. Yet if you manipulate your breath in either direction you will cause your heart rate to change correspondingly as a consequence. Long term unexpressed anger can have significant long term health consequences. This is a form of stress that heightens the functioning of the sympathetic nervous system. This sets off a chain of events that allows us to survive combat. It includes increased adrenalin that speeds reflexes, shutting down the digestive system (also why people sometimes get sick or feel the need to evacuate bowels etc. at times of high stress), and cutting of circulation to the extremities (this slows the bleeding from the inevitable cuts and tissue damage). But to live like this all the time causes heart conditions, digestive problems, depression and/or poor impulse control, and suppression of the immune system (documented in the new science of psycho-neuro immunology). Breathing techniques and muscle action trigger the alternate set of hormones of the parasympathetic nervous system that neutralize the harmful effects of chronic “hyper-alertness” caused by the sympathetic nervous system. Some call it “full catastrophe living”. Martial arts mobilize the physical counterbalance and when combined with breathing and meditation restore “homeostasis”… that is, healthy physical balance. The mind set developed by insightful training adds relaxed alertness. To me this is the true state of the warrior. When we have chronic long term anger, zen training suggests that this is “attached” anger. That is an anger that is connected to a deep and chronic underlying feeling state. Healthy anger is like a thunderstorm on a humid day… it cleanses the air… quickly departs and is followed by a cooler and more comfortable environment. Attached anger repeats and repeats and never dissipates… maybe just goes into remission and this isn’t healthy. The movie quoted “Network” was written by Paddy Chayefsky who was an angry man who was frustrated that he couldn’t change the world. He died of cancer at 58… very young to me because I’m already older than that! So perhaps proof of the damage of anger? All I know is that first you’ve got to get mad! You’ve gotta say "I’m a human being, goddammit! My life has value!" This is ultimately what martial arts can give us… especially true Budo. It’s an existential statement that says life has value. "Through the alchemy of martial arts training one can bring about positive change. " From my experience with teaching self defence, I would have to say that there is a place for anger. The place is when you can use it to fuel yourself in a critical or self defence situation. Controlled rage (though never "losing control") in this situation may help you even up the odds and intimidate the hell out of your opponents. I think day-to-day anger management is key towards harnessing this energy. If you are uncontrolled - lashing out at the smallest event, what chance do you have to focus this natural emotion? During my warm up sessions, sometimes when the going is really tough, I'd ask my students to 'show no emotions,' and keep a calm visage. Helping them to control facial expressions in training may help them control their inner selves. Anger as a strategic device. Sure, why not? Not as an expression of machismo, but just to even the playing field. I'm sure Musashi used this ploy at sometime or another. Helping them to control facial expressions in training may help them control their inner selves. I agree. Some believe body language represents what's going on inside. The truth is, it can be a two-way street; breath, posture, and even facial expressions are capable of determining the quality of our own psyche.